Adventures in Wellington: What's the F***ing Difference? Let me tell you! What's the F***ing Difference? Let me tell you! It has come to our attention several times that many people do not know the difference between Disneyland and Disney World. To us, the differences are large (and many), so it's a tad frustrating to answer "How was your vacation is Disneyland?" with "Well, we didn't go to Disneyland..."
'Trivial', you say! Not to us! The first of Walt Disney's theme parks, this location (Anaheim, California) was opened on July 17th, 1955 and holds the distinction of being the only theme park to be designed, built, opened, and operated by Walt himself. Disneyland property is 500 acres of land surrounded by a city in CA. Its size is restricted by the city itself, as Walt did not envision the mass consumerism and cheap (and rather ugly) elements that would spring up around the gates of Disneyland and skew his vision even further. He vowed to avoid this with Walt Disney World. Disney's California Adventure Park(DCA) was the most recent addition to Disneyland. 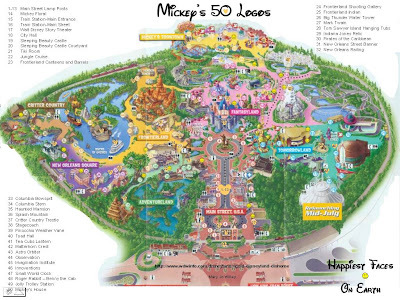 This 55 acre park was added to Disneyland on February 8th, 2001 and in conjunction with the on-property hotels. The name of the park was changed from Disneyland to Disneyland Resort to create a distinction between it and its distant cousins around the world. Sadly DCA has not seen the attendance it was hoping for, and a major expansion (internally) and upgrades are hoping to increase numbers in the coming years. Attendance Fact: There are nearly 40,000 daily visitors at Disneyland in Anaheim, California. That’s like if the entire city of Annapolis, Maryland decided to go to Disneyland one day. And even more people go on the busier days! The second of Disney's theme parks. Sadly Walt passed away (December 15, 1966) before it was completed and opened on October 1st, 1971 in Orlando, Florida with the Magic Kingdom theme park. Since then, additional theme parks were added starting with Epcot (on October 1, 1982), Disney's Hollywood Studios (on May 1, 1989), and Disney's Animal Kingdom (on April 22, 1998), and two water parks - Typhoon Lagoon (1989) and Blizzard Beach (1995). At present, WDW has 32 resorts and hotels operating on-property (22 of which are Disney owned and operated) and the entire complex is considered a separate county. WDW has their own Board and Committee and their own municipality services (including, fire, police, ambulance, monorail, bus service, etc) all under the name Reedy Creek Improvement District. Disney spends more than $100 million every year on maintenance at the Magic Kingdom. In 2003, $6 million was spent on renovating its Crystal Palace Restaurant. 90% of guests say that the upkeep and cleanliness of the Magic Kingdom are excellent or very good. The resort features a Automated Vacuum Collection system for waste disposal; just one of two places in the USA to do so. 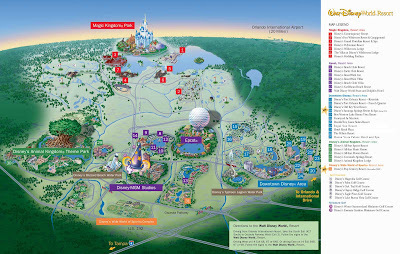 WDW is broken down into 4 major park and resort locations. There are of course additional areas within these areas (water parks, resorts, etc) as well as additional shopping (Downtown Disney) and Entertainment areas (Pleasure island-closed September 27th, 2008 and Disney's Boardwalk). WDW employs more than 63,000 people, spending more than $1.1 billion on payroll and $478 million on benefits each year. The largest single-site employer in the United States, Walt Disney World Resort has more than 3,000 job classifications. The WDW owned property is exactly 30,000 acres, however only 10,000 is currently in use with 10,000 acres that will never be developed (saved purely for conservation efforts) and another 10,000 that is available for further expansion of the WDW parks and properties. Attendance Fact: There are roughly 117,260 daily visitors at Walt Disney World just southwest of Orlando, Florida. This includes all four theme parks but doesn't not include people going to the two water parks, Pleasure Island/Downtown Disney, Disney Resorts, or just coming to use the recreation (golf, mini golf, Sammy Duvall's, etc.). Haunted Mansion: The stretching room goes down in DL, while the ceiling stretches upward in WDW. Also, DL decorates the Haunted Mansion with a "Nightmare Before Christmas" theme for the Halloween-Christmas seasons each year. Matterhorn/Big Thunder Railroad: Big Thunder Mountain Railroad is larger and considerably more detailed in WDW than the original Matterhorn in DL. Autopia/Tomorrowland Speedway: The only remaining Tomorrowland attraction from DL's opening day, Autopia is considered a much more fun ride than the Tomorrowland Indy Speedway at WDW. The Autopia cars each have their own personality, and you get to travel through different terrains on the journey – including an off-road section! Splash Mountain: Though nearly identical in both DL and WDW, the order of the scenes are changed and it is a common opinion that the logs in WDW are much more comfortable. We hope that clears everything up! Any questions? Thanks for all the info! It's so stupid that people think they're the same, though. It's like, if you went to New York City and people were like, "How was Baltimore?" They are just simply different places. But anyway, a thing that I think is interesting is that a lot of people use "Disney World" to mean "Magic Kingdom." I wonder if that's a carry-over from when MK was the all there was to Disney World? Well duh. I can't believe people can't tell the basic difference between Disney in CA and Disney in FL!!! Dude, sweet mother of Minnie Mouse. YOU are the authority on all things Disney. Holy crap. Now that we've established your reputation of awesomeness, please get W the hell outta DC.